Sleek, simple desk elevation. You can have it all with the UPLIFT Eco Desktop, our most affordable way to get the spacious standing desk of your dreams. Just pair with one of our reliable UPLIFT sit-stand desk frames to keep you working in healthier postures for you. The large desktop surface boasts a seamless finish, smooth corners and edges, and the Corner Eco Desktop features a center cut-out with an ergo edge on the inside to get you closer to your work surface. Sustainable, free of solvents, and non-toxic, these powder-coated MDF desktops are made from 100% pre-consumer recycled wood, allowing you to do your part to help the environment while also improving your health with a height-adjustable desk. Choose from a collection of desktop sizes for nearly any workstation setup you need. Our UV-cured powder-coated desktops are made of 100% recycled wood composite, and available in black or white. Choose either a standard rectangular shape or a rectangular desktop with center cut-out. Our UPLIFT Eco Rectangular Desktops are available in two depths: 24" or 30" deep. Choose from the following widths: 42", 48", 60", 72", or 80" wide. Our UPLIFT Eco Curve Desktops are 30" deep. Choose from the following widths: 48", 60", 72", or 80" wide. 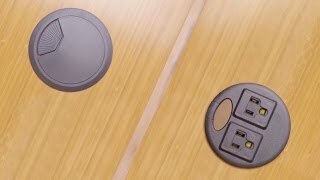 Grommet holes allow for easy wire management, and you can choose to add power grommets below for an in-desk power solution. Choose to add grommet holes to your desktop, or go with no grommets if you don't need cable management. Grommets are located fifteen inches from the center of the desk, to the left and right. We've found that this allows for the best combination of cable management and accessory use. $189.00 List Price: $425.00* The list price is the same as the MSRP (Manufacturer's Suggested Retail Price). It may not necessarily be the price at which the product is sold.